Shirts With Random Triangles: West Virginia head coach Dana Holgorsen shares what three Alabama games from 2013 he might be focusing on as he prepares for 2014 Chick-fil-A Kickoff Game. 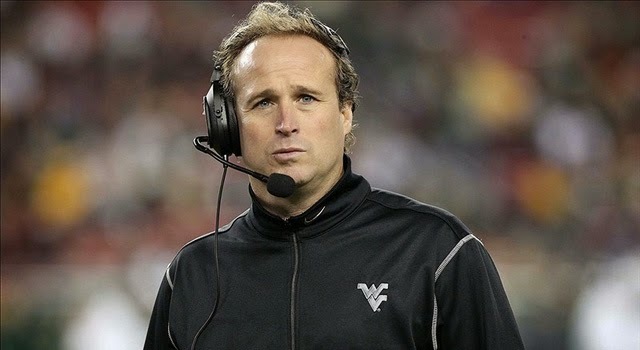 Holgorsen discussed with The Charleston Daily Mail that he and his staff might review film on the Tide's win over Texas A&M, the Iron Bowl loss to Auburn, and the 2014 Sugar Bowl loss to Oklahoma, as part of West Virginia's preparation for the Aug. 30 matchup. Oklahoma and Texas A&M have similar offensives to West Virginia, while Auburn's hurry-up no-huddle is not in the Mountaineers repertoire, Holgorsen explained what might be gleamed from studying the Tigers. "They're quite a bit different, but it's a spread," Holgorsen said of Auburn. "It's more of a run game spread, but it's up-tempo, the sets are good and there's a lot of motion. It'll be good for us." The Chick-fil-A Kickoff Game between West Virginia and Alabama will take place at the Georgia Dome in Atlanta on Aug. 30.